Liz tells Siobhan that she made a mistake and gave her the wrong medication, but Matt corrected the problem and she’ll make a full recovery. Liz mentions to Siobhan that she&apos;s happy she&apos;s going to make it. Steve tells Scrubs that he’s up for a board review and they’re checking previous issues. Patrick feels Liz is their best nurse and doesn’t want to lose her because of an accident. Robin says she’s covered for Liz a couple of times. Liz lets them know that she explained to Siobhan what happened and Robin figures Siobhan will understand that it was an honest mistake. Matt brings up the previous admissions mistake. Liz admits it, but says she took care of it. Shawn’s back in town and is angry with Jax for sending him a summons. He feels he has nothing to contribute, but Jax says he’ll be useful to his case, due to Carly never checking his background. Shawn says he was hired to protect Joss from Franco, but Jax feels he should have never been around Joss. Shawn points out that karma has a way of coming back on someone. Carly lets Jason know that Morgan received a subpoena and Jason is likely next on the list, but that doesn&apos;t concern him. Carly knows that Jason stepping out of Jake’s life will be brought up. She doesn’t understand why Jax is hurting so many people and feels he’s not the man she married. She’s worried that the court will side with Jax and forces Jason to promise not to let her get married again. When Sam gets home, Jason tells her about his visit with Carly and the promise he made about marriage. The two discuss marriage and Sam says she doesn’t want them to resent each other. Sam feels some people are better off not getting married, because they need their freedom. Jason wonders if that’s what she wants, but she accepts him and their life as it is. Ethan sees Abby at Kelly’s and they discuss their plan to get Kristina to back off. Ethan’s starting to have second thoughts because of the look on Kris&apos; face, but Abby feels it’s the right thing to do to save Kristina trouble down the road. Ethan points out that Michael is a little young for her, but Abby feels they understand each other and age doesn’t matter. Kristina arrives, so Abby and Ethan hold hands. Ethan and Abby pretend to reminisce about their time at Vonn’s, and Kris says she had no idea about it. The two lay it on pretty thick until Kristina leaves. Kristina goes to Michael’s office and tells him all about Ethan and Abby&apos;s scene at Kelly&apos;s. Michael explains that he trusts Abby and it likely wasn’t what she thought. He also thinks what she saw says a lot about Ethan. Kristina assures him that Abby will not get Ethan. Abby arrives and claims Ethan is pursuing her, not the other way around. Kristina accuses Abby of using Michael for his money and making a fool of him. Abby points out that Kris should want her and Michael to stay together, because otherwise Ethan would be all over her. Kristina tells her to stay away from Ethan. After she’s gone, Michael feels badly for deceiving her. Carly runs into Shawn and they make small talk about Josslyn. He apologizes for not telling her the truth about his past. In turn, she’s sorry Jax will rake him over the coals. Ethan visits Johnny and updates him on Anthony&apos;s earlier confrontation with Kristina. Johnny’s not all worried, but Ethan tells him not to put blinders on while Anthony targets women and children. Johnny says his father likes to play games and wonders why Ethan is so worried. Ethan feels he owes Kristina and admits he cares about her. Anthony returns home and is angered by Ethan&apos;s presence. Anthony lays into Ethan for suggesting Anthony is a threat to Kristina. Ethan warns him again to stay away from Kristina. Anthony says Ethan needs a lesson in respect, but Ethan feels he’s good at improvising and Anthony better be careful. After Ethan leaves, Johnny tells his father he doesn’t like that he was targeting Kristina. 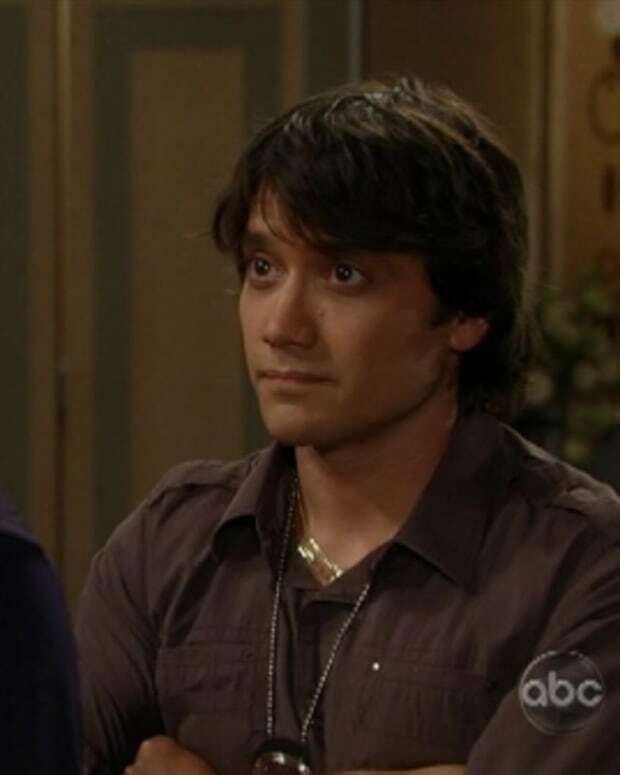 Anthony feels something like that could push Sonny over the edge in anger, which would allow the Zacchara&apos;s to take him down. Johnny wants him to leave the women and children out of it. Anthony claims to have no interest in the children, just Brenda. Liz comes back from the board meeting and informs everyone that she took responsibility for her actions, knowing full well that it could end in her termination. She’s sorry she came back to work so soon, hoping that it would help her deal with Jake’s loss. Steven shows up and tells her she’s been suspended from work for three months, and from the OR for six months. He says he’s on probation for two months. Siobhan walks up, unhappy that they all seem happy for being off the hook for trying to kill her. Siobhan voices her anger in everyone defending Liz&apos;s actions and accuses her of forging Aiden’s paternity test. She thinks Liz had a built in excuse, grief for Jake. Patrick defends Liz, saying she wouldn’t have made the mistake on purpose, but Siobhan says she’s suing everyone for malpractice. Carly angrily shows up at Jax’s, only to find the mediator waiting for her. Grace tells her it’s an informal visit and asks about Carly’s goal for raising her daughter. Grace asks about whom lives with Carly, and regular visitors like Sonny and Jason. Carly assures her that they’re simply coffee exporters and Josslyn is happy and thriving. When Grace brings up Michael’s prison past and anger issues, Carly assures her that Michael does not have emotional problems. Then, she becomes enraged with Jax for doing this and calls him an SOB!